I have two points consuming my thoughts and therefore, this post will address two different matters. Or, are they really that different? Are they really only two thoughts? Perhaps, it's more of a blend. One is a matter of classroom happenings and the other is a matter of what we send home from the classroom (read: homework). Perhaps they are more interconnected than one may realize. In fact, they are, in a lot of ways (beyond the fact that they both relate to school). A teacher's approach to education will directly affect both what you will observe in the classroom and what you see the students taking home in the way of assignments. Let's start within the classroom. I recently spent some time in a couple of primary classrooms. The expectation was that students would work quietly at all times. I personally remind students to raise their hands when they need my assistance, rather than shouting out. (Have you ever experienced 15 primary students shouting out your name? It can become a little overwhelming, to say the least.) While continuing to enforce the "raise your hand for help" guideline, we relaxed just a bit on the working in silence expectation. And then, magic happened. As students collaborated, they worked through problems and came up with solutions. When given free choice on their activities, a large number of students selected coding activities. The noise level was a little higher, but the creativity was increasing with it. The great part was that it seemed to be more of a "buzz" of work and creativity than just noise. When one student offers to help another and they find something new together then explore it first together then independently, amazing things transform. 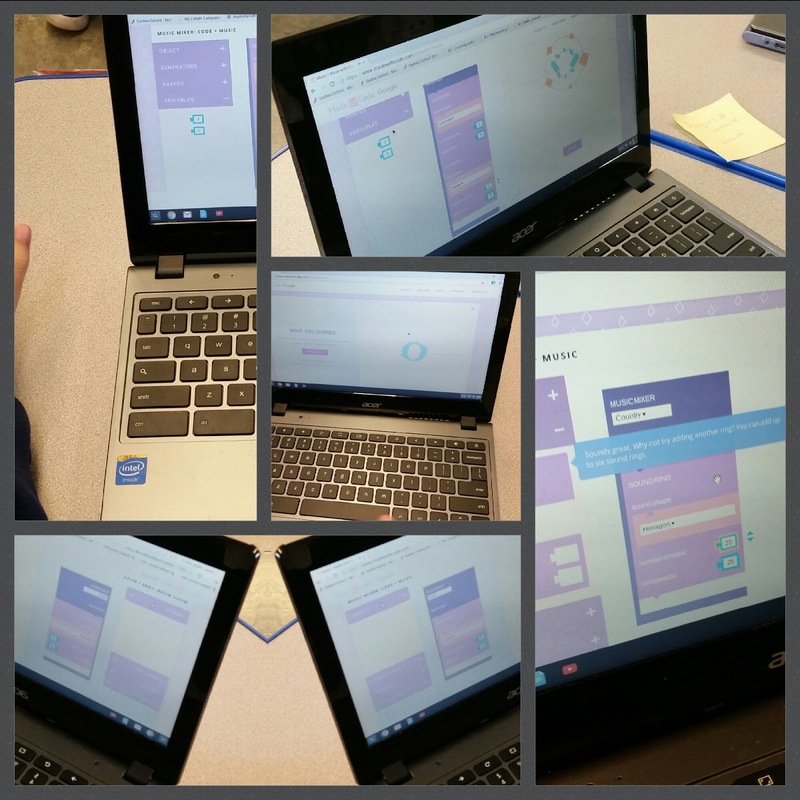 One situation that I found particularly striking was after a few students discovered the Music Mixer on the Made With Code website. Fantastic! Allons-y! Students created music with code! In a recent Twitter chat, another educator shared that something that transformed her as an educator occurred in her first year of teaching. A student taught her that not everyone does their best work sitting at their desk. I had a student like that my first year working in primary education. There were times when he absolutely needed to stand to work at his desk. He produced some pretty incredible things. He's older now and still does some of his best work standing. He also has an aura of creative genius about him. I am thankful for what I learned from him, and continue to learn from him. In second grade, he was fascinated by square roots and was self-teaching himself a lot of it. (Square roots, of course, come later in math curriculum.) I loved when he would greet me with a new square root that he learned or ask me about one he wanted to know. This year, I have seen him do some incredible video editing and we won't get into video until next year. He has helped other students in another grade level with theirs. His enthusiasm for learning and his passion for creating continue to show me that there are a myriad of ways students learn. We need to help them embrace learning in ways that work for them. Carpe diem! And, seize the opportunity for learning! If you've read previous posts, you know that I gain so much from the DitchBook Twitter chats on Thursday evenings. The fact that my children know that on Thursday nights, I have "an Ed Chat" and they both support and encourage my participation means that I have shared things effectively at home. Every day I enter the classroom or interact with a teacher and share something I've learned then see the results, I know I have effectively participated in this chat. (Side note: one week when I had a schedule conflict, my son told me that I needed to Tweet out ahead of time that I would miss the chat. I thought the same thing, but I treated it as taking his advice. This thrilled him...and me!) This week, the chat revolved around homework. Ahh....homework. My big take-away includes a development of thoughts I had previously. Homework for homework's sake is about as effective as technology for technology's sake. We, as educators, need to carefully think about the purpose behind homework we assign. Do we want students to earn points? Do we want to reinforce what we instructed that day? Do we want students to demonstrate what they have learned? Do we want to keep them busy? Our ultimate goal behind the assignment will make a significant difference in the the type of homework assign and the amount we send home. When we find an approach to homework that works best for our students and nurtures learning, then we need to communicate it to the parents. Communication is a key to success on multiple levels. As a parent, I loathe the amount of paper that comes home, but I appreciate the way homework is communicated to me. If the type of homework changed suddenly, I would expect that the teacher would communicate that. I try to remember my parent mindset when functioning as a teacher, and vice-versa. I have always preferred project-based learning to worksheets. When I had students in science classes take notes as a means of becoming familiar with vocabulary, I had them take notes in ways that worked best for them. Every student had a composition book and I had certain expectations about what would go into them, but HOW those notes were made, I left up to the students. Some color-coded, some did outlines, some scribbled their notes in ways that they could understand and I, at least, could decipher as I checked them off. Some made illustrations. When it came time to demonstrating what they learned, I loved seeing the terms incorporated into lab write-ups, stories, and project descriptions. Wait. Stories? In science class? YES! I had eighth graders incorporate the science they learned into writing science fiction stories. The emphasis was on the science, but they had to create something around it. That usually came later. We built up to it. First I would have them do scientific analyses of other science fiction pieces. Ray Bradbury was part of our science learning. His short story Kaleidoscope provides great learning and a chance to apply learning. I hope to one day have a class where I can incorporate his short story The Rocket, now that I have discovered it. Our students can benefit from high expectations. They can apply what they learn outside the classroom doors We need to encourage them to think differently. When a student comes back and shares an experience that relates to something they learned in my classroom, we high-five, a little cheer sets off inside me, and I know something happened just as it should. My goal has always been to help guide students so that when they go outside or into the kitchen or on a train or anywhere, that they can see science, history, culture, math, language arts. I want them to go forth and CARPE DIEM! I dream big for them, but hope that I do more than that. I hope that I show them how dreaming big pays off and that transforms into encouraging them to dream big for themselves. We are in tax season, a time when adults are sitting down to fill in their worksheets and calculate math problems. But, let us stop and think about what we do the rest of the year. When we go into the kitchen and create a new recipe, what are the things we need to know? When we pack for a camping trip how do we decide what to take? When we visit an historic landmark, what are we hoping to see and experience? Where do the roots for this thinking originate? How can we nurture it? Let us think of these things as we consider what we will assign for homework. Let us remember to communicate our goals to our parents. Let us nurture learning, exploration, and creativity in our students. When I first joined Twitter, I did so reluctantly. I had my reservations, but I was so excited about what had been shared at a one-day workshop that my principal sent me to that I knew it was worth trying. So, I did. A year later, I did a little self-promotion within the Twitter world as I set a goal to reach 100 followers. I thought 100 followers would be a great accomplishment. With a little help from my friends, I reach that goal. I still rarely, if ever used hashtags. I, honestly knew little about how to use them. Slowly but surely, they crept into my Tweets. Then, last spring, I joined Instagram with the help, encouragement, and urging of my students. Suddenly, I found myself hashtagging posts like crazy. I found a couple that I liked and I developed a couple of my own. Last summer, I started #wheresmsrnow so my students could follow awesome science adventures in the off months. I made a little game of it. But, I kept it. Periodically, I post to Instagram and Twitter with that hashtag. I also use #EduAwesome #Adventure for many of my posts. Afterall, this crazy thing many call life, I call an adventure. And, I am a #lifelonglearner. What developed in 2015 was more than that. As I started using my "own" hashtags more (I realize #EduAwesome and #Adventure both are used by many), I started using others to meet other EdTech folks on Twitter...and beyond. I also started getting my feet wet with Twitter chats. Every week I participate in a couple of chats now. Most times I'm on my phone and have to get a little creative. A search using the related hashtag does the trick for helping me follow, phone in hand as I prepare dinner, help my kids with homework, attend a local event, or am otherwise involved in "IRL" matters. My students, CUE conferences, interactions with amazing educators have all contributed to my use of hashtags and my involvement with my students, CUE conferences, and interactions with amazing educators has developed because of the use of hashtags. How about that? What was just a pound sign has become so much more. As reluctant as I was to start on Twitter, I was even moreso to start hashtagging. And look at me now! How have you used hashtags to make a difference in your life as an educator? Note: In a Technology Committee meeting earller this week, for a brief moment, I spoke in hashtags. That was weird. For a minute.